Welcome to the River Isles Website! River Isles, a premier community for vibrant adults 55+, is located just minutes from I-75, the Sarasota-Bradenton International Airport, Gulf of Mexico beaches, and many attractions. This deed-restricted community of well-maintained, single-family homes is located along the Braden River. Our quiet streets are suitable for leisurely walks and a warm wave to a neighbor. 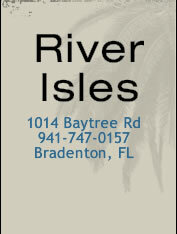 With an executive nine-hole golf course (riverislesgolfclub.com), River Isles has something for everyone. River Isles is a Bradenton Police Certified Neighborhood Watch Community, as well as a Volunteer Security Patrol Program. Click here for the complete activities calendar for the month of April 2019.